We demonstrate generation, manipulation, amplification,and detection of highly directional broadband THz waves in laser-induced air plasma. 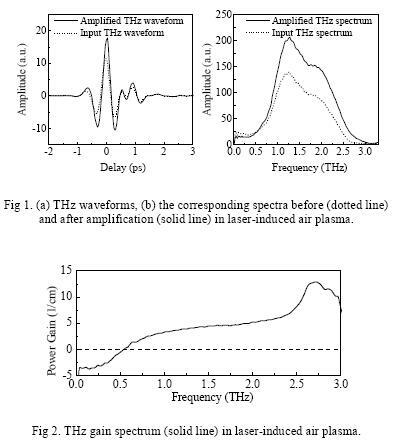 After the first demonstration of THz wave time-domain spectroscopy in the late 80’s, the time-domain THz community commonly uses coherent emitters and detectors for pulsed THz waves, which are mainly limited to photoconductive dipole antennas and electro-optic crystals [1, 2]. Ambient air, a third-order nonlinear material, exhibits a remarkable performance for the generation, manipulation, amplification, and detection of pulsed THz waves with excitation by femtosecond laser beams. Experimentally, a desktop Ti:sapphire regenerative amplifier is used as the femtosecond laser source for the generation, detection,and amplification of THz waves. Air plasma (ionized gas molecules), created by a mixed optical beam (fundamental w(800 nm) and its second harmonic wave 2w(400 nm)), produces very intense, highly-directional, and ultra-broadband THz waves through third-order optical nonlinearity [3, 4]. To investigate the amplification effect of THz waves in air plasma, a gain beam, as well as its second-harmonic, is focused by an optical lens, forming an air plasma spot. An input THz beam is focused onto the same plasma spot in a collinear geometry by a parabolic mirror with a hole to allow the gain beam to pass through,and then the output THz beam (i.e., the amplified THz waveform) is detected by an 1-mm thick <110> oriented ZnTe crystal. Fig. 1 shows the waveforms and their corresponding spectra without and with air plasma by blocking and unblocking the gain beam, respectively. With a plasma length of about 2 mm, the input peak THz signal is amplified by over 50%. Fig. 2 plots the gain spectrum, indicating a gain obtained in laserinduced air plasma over the frequency range from 0.5 THz to 3 THz. The amplification effect demonstrated here is basically attributed to high-order optical parametric processes. Further theoretical analysis and calculation is currently under investigation. We demonstrated the generation, manipulation, amplification and detection of THz waves in laser-induced air plasma. Our demonstration, rich with science and challenging technology, provides a new direction for THz remote sensing. D. Grischkowsky, S. Keiding, M. Exter, and Ch. Fattinger, “Far-infrared time-domain spectroscopy with terahertz beams of dielectrics and semiconductors”, J. Opt. Soc. B, vol. 7, pp. 2006-2015, October 1990. Q. Wu and X.-C. Zhang, “Free-space electro-optic sampling of terahertz beams”, Appl. Phys. Lett., vol. 67, pp. 3523-3525, December 1995. D.J. Cook and R.M. Hochstrasser, “Intense terahertz pulses by fourwave rectification in air”, Opt. Lett., vol. 25, pp. 1210-1212, August 2000. T. Bartel, P. Gaal, K. Reimann, M. Woerner, and T. Elsaessr,“Generation of single-cycle THz transients with high electric-filed amplitudes”, Opt. Lett., vol. 30, pp. 2805-2807, October 2005. X. Xie, J. Dai, and X.-C. Zhang, “Coherent control of THz wave generation in ambient air”, Phys. Rev. Lett., vol. 96, 075005, February 2006. J. Dai, X. Xie, and X.-C. Zhang, “Detection of broadband terahertz waves with laser-induced plasma in gases”, unpublished.